Drawing and Planning have successfully secured a Certificate of Lawfulness for extension to roof including hip to gable end, 1no rear dormer with juliet balcony and 2no roof lights to front elevation. Erection of an outbuilding in rear garden. Erection of a front porch extension. 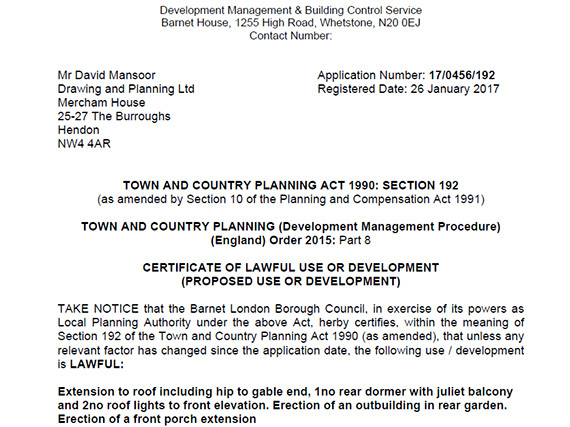 PROJECT Certificate of Lawfulness for extension to roof including hip to gable end, 1no rear dormer with juliet balcony and 2no roof lights to front elevation. Erection of an outbuilding in rear garden. Erection of a front porch extension.